Three brick masons laboured diligently side by side, in the heat of the day, covered in dust, backs aching,and dripping with perspiration. With calloused hands, they arduously laid brick upon brick, building what appeared to be a huge project. Leaving the man to his work the passer-by approached the second tradesman and asked the same question, to which the man replied ” I am building a wall, a very big wall”, and turned away to get on with the job. Still not satisfied, the passer-by approached the last tradesman with the same question ” what are you doing. ?” he asked. The tradesman looked up, straightened up, wiped away the sweat, smiled, and staring past the wall he was building, he said ” I am building a grand Catheral” he said proudly. Suddenly the passer-by was engaged to know how, when, what for. Each day as he walked by the site, he inquired after the worker, took an interest in the progress, and eventually employed this man of vision for his own project. 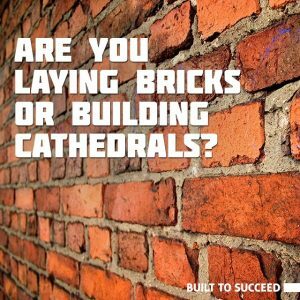 You see by knowing “why” he was laying the bricks, this tradesman knew the bricks in his hand were more than just a plain brick, he knew they were an essential peice of a grand cathedral. Do you know “why” you do what you do? At Business Edge we celebrate and validate those who work in the marketplace, those who operate in business, and lead others. Let us help connect you with others and discover your WHY.. You have been called for ‘such a time as this’ and we honour you! Join Business Edge to be encouraged in your endeavours!